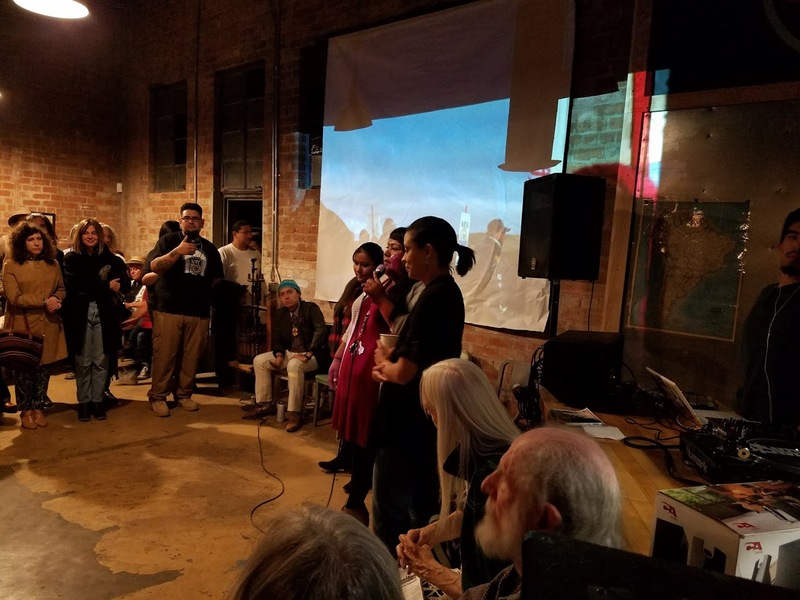 Tucson Water Protectors speak about their experiences at Standing Rock. 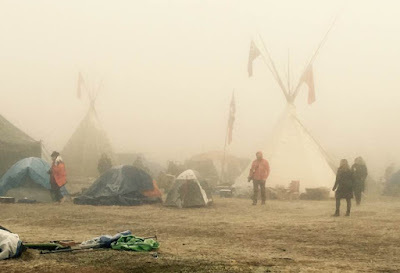 I have been following the Standing Rock Sioux and the other Water Protectors in their peaceful, non-violent stand against the Dakota Access Pipeline. Energy Transfer Partners, an oil giant with a horrific record of environmental devastation (pipeline leaks and explosions, abandoned oil spills) plans to build a pipeline under the Missouri River that supplies water to 17 million Americans. Water Protectors chant, "Mni Wiconi, Water is Life” as they use their bodies to block construction of the illegal pipeline. (Thanks to their efforts, the permit was denied.) Police in riot gear have responded by brutally attacking them with rubber bullets, mace, and water cannons in freezing temperatures. One young woman was blinded by being shot in the face at point blank range. Another woman had half of her arm blown off by a concussion grenade. The Water Protectors have been unjustly arrested, strip searched and held in kennels. Elders have been handcuffed and arrested during prayer ceremonies. This is unacceptable! These courageous Water Protectors are fighting for our water! Unable to pack up and head to their camp in N. Dakota, I’ve done what little I can as a desk top activist: writing blogs, signing and sharing petitions, and reposting drone videos that show what is really going on at Standing Rock. (After 6 months, national news stations finally started covering this historic event when two thousand vets arrived to defend the Water Protectors from police brutality. The local news in N. Dakota is basically a mouthpiece for the DAPL owned police, so the people from nearby Bismarck don’t even know what’s really going on.) I called several sheriff’s offices that deployed officers to further incite the violence. I left messages at the White House, the Army Corp of Engineers, and the Justice Department. All the while, the brave water protectors were sacrificing their livelihoods and putting their bodies in the line of danger - fighting our fight. It just didn’t feel like I was doing enough. So when I heard about the No DAPL Night at Exo, Dan and I decided to attend to show our solidarity with the returning Water Protectors and to donate money that we knew would reach the people still at camp. At this Native American gathering, they opened with a traditional blessing of the Tohono O’odham. They asked the crowd not to record this sacred blessing. Tohono O’odham drummers then performed two prayers: a traditional song and one written in support of Standing Rock. 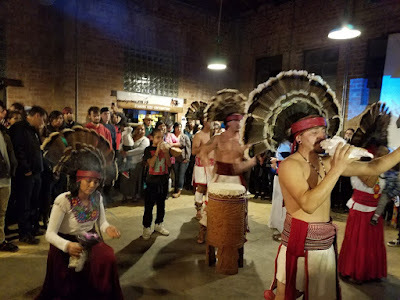 There was a danza in traditional garments. A dancer graciously thanked us for joining them. I felt honored to be included. Having had contact with other Native Americans, I was aware of how leery they are of sharing their culture and sacred prayers with outsiders – since they have been exploited in the past. But here they were sharing it freely. I believe this is one of the lessons they took with them from Standing Rock. Indigenous people are drawing strength from their culture and beliefs to embrace their role as protectors of Mother Earth. They are leading the way and welcoming other good-hearted people to join them. It is beautiful to see them reclaiming their language and heritage. I have noticed at several community events, the Native American speakers greet their people in their native language first before addressing the crowd. To understand the significance of this gesture, it’s important to know that Native American children were taken from their homes against their will and sent to boarding schools to assimilate into white man’s culture. They were beaten for speaking their language or for practicing their religion. Through prayer and love, these courageous people are learning to forgive and to work with others for a greater good - protecting Mother Earth. 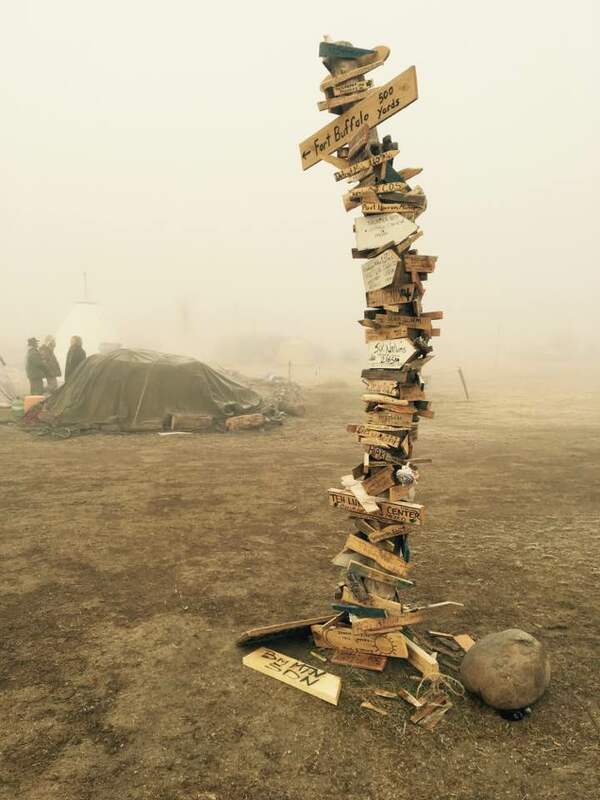 We were blessed with news from the returning Tucson Water Protectors from the Oceti Sakowin camp. 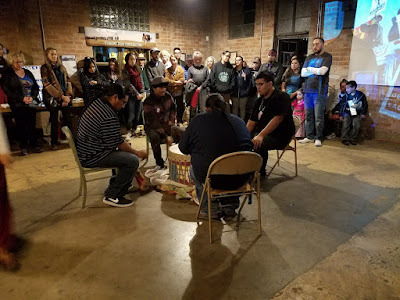 They were there to share what they learned about prayerful, peaceful resistance and to continue their loving quest to protect water, sacred places and all human lives now that they are back home. Some ways to help... Pull your money out of the banks that are invested in DAPL. Donate to the Legal Defense Fund. 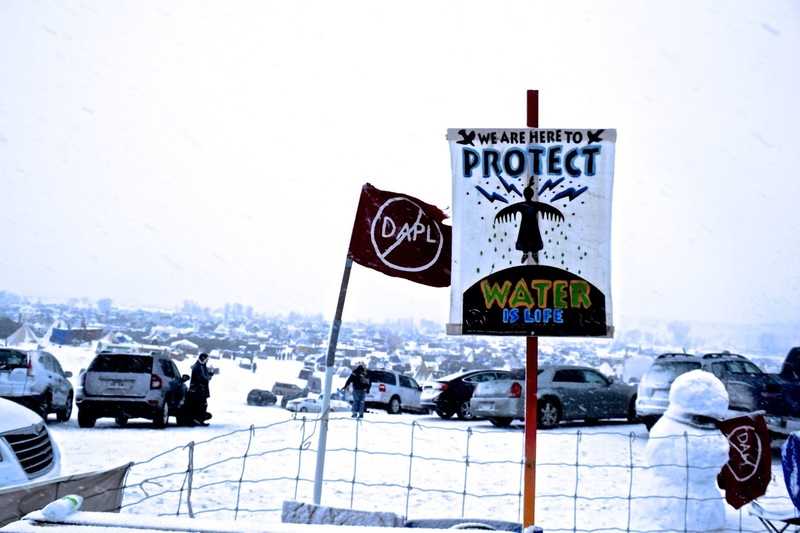 Help the Water Protectors that are still in N. Dakota get through the hard winter. Share updates about the Water Protectors on social media. And sign petitions. I would love to connect with other water protectors in Tucson. I've tried through FB but no response. I would like to tell my story as well. Is this possible? I would also LOVE to organize protests at banks, and organize donations. They are in need of: Fire wood, Propane, Hay bales, Blankets for horses, Dog food and water testers. I asked what kind and Lisa said to test the streams for contamination. Thank you. Aho. 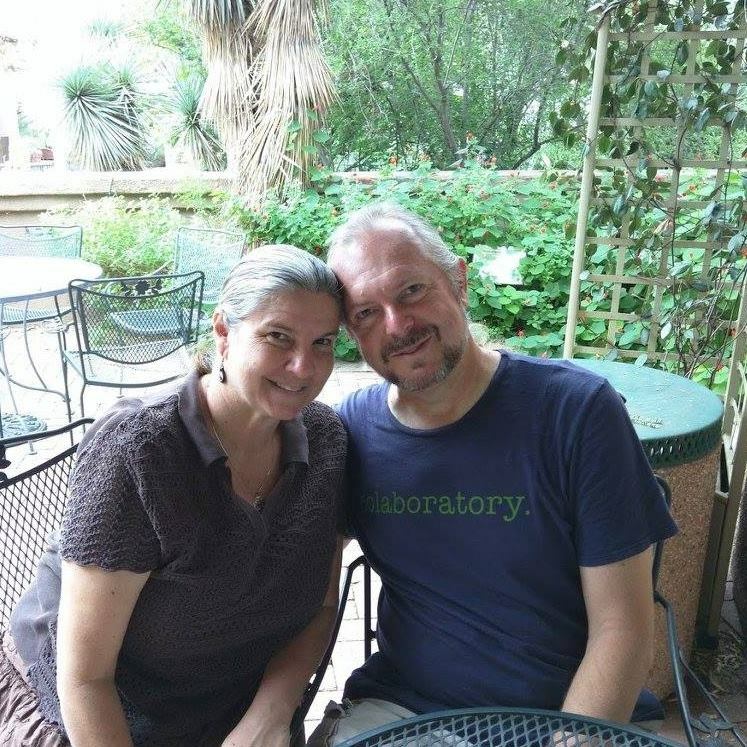 Elizabeth, thank you for letting me use your powerful pics! And thank you for supporting the Water Protectors by standing in solidarity at the camp. I would love it if you would share your experiences with us!